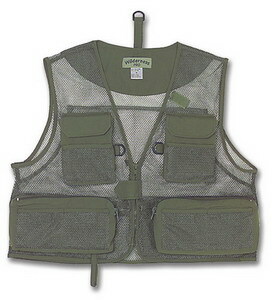 A good fly vest is almost a requirement for an angler. It helps keep all those necessities close at hand, even when you are thigh-deep in the river. 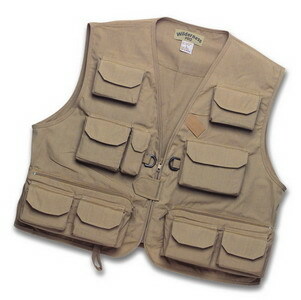 A good vest will provide room for a small fly box, sunblock, multitools, line clippers and just about anything else your little 'ol heart desires. Don't skimp on your vest. The last thing you need is to be fishing and have a seam start to unravel or a pocket start to come off. 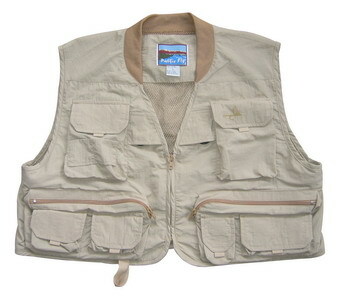 A cheap fishing vest will also not feel as comfortable at the end of a long day of fishing as a well made one. You may find these vests were not designed with the fly fisherman in mind, either. The pocket system can be completely disorganized. And the pockets… while they are all important, too many can make your vest less help than if you had fewer key pockets. The universe hates a vacuum, and if you have an empty pocke,t or two, or ten, you'll end up stuffing them full of something. Then when you're on the river, you'll find yourself searching pocket after pocket to find the tool you need. A fair number of pockets is between 15 and 30. This will give you enough to carry plenty of supplies, without it becoming overwhelming. Next, think about the size of the pockets. You should have some small pockets and some larger pockets. 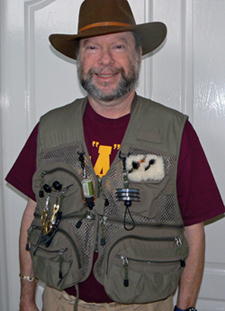 It is useful to have some larger pockets that can hold a fly box and other larger bits of gear. 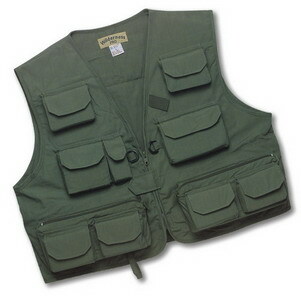 If you can find a vest with 4 to 8 larger pockets and 6 to 10 smaller pockets, you should be set for most fishing trips. If you tend to fish far enough away from your car and have to hike back to it at the end of your day, you may want to choose one with more space. Next, you need to choose between fabric or mesh. A mesh vest will be cooler on a hot day, and some say they move with the angler a bit more since it is somewhat stretchier. A good fabric vest will last for years. Ultimately the choice is yours. Whichever one you choose, get the best you can afford. Fishing vests take a lot of abuse during fishing trips and neglect between trips. You'll want one that will hold up well for years. Don't forget about comfort. An uncomfortable vest will start annoying you within a few hours on the river. Look for a vest that helps distribute the weight around your body, rather than letting it hang from your neck and shoulders. 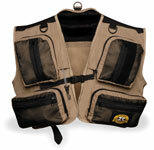 For $60 or less, you have several types of fly fishing vests to choose from. Even at this price, you can find some quality fishing vests. Some are equipped with six large capacity exterior pockets, a pliers pocket, pigtail retractors, a rod holder and a utility D-ring on which you can hook essential equipment. Interior pockets are available for sunglasses and tippets. Large items can be stored in the large storage pocket on the back. Another option is a mesh vest that lets the air circulate freely to keep you cool on hot days on the river. This style has eight pockets, two large lower pockets equipped with zippers, a rod holder a D-ring and back storage pocket. 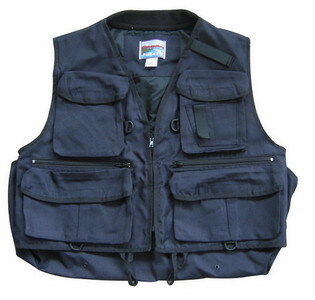 Another version in this price range offers a durable vest made of cotton/polyester. This version features two large zippered fly box pockets, two inside pockets with Velcro to hold small tools and thermometers, a rear pouch large enough for rain gear, lunch, or anything else you may need, and lots of smaller pockets on the front. For those who need a lot of pockets, look for one that offers 14 front pockets and 12 interior pockets. It also features a specially designed tippet minder, two reel pockets on the back that zip closed, two large cargo pockets in the rear to hold bulky items, and tech tape pulls on the chest pockets for easy access. A soft rib-knit collar and neoprene yoke offers a comfortable fit. For minimalists, you may want to check into chest fishing vests. This style covers only the front with a low profile pack. A main compartment zips open. Mesh hinges let the main pocket open to a 90 degree angle. They also help prevent fly boxes from falling out. Inside, you'll find two smaller hook and loop closed mesh pockets. A zippered security pocket on the back of the chest pack is the perfect place to keep your wallet and keys or other small valuables. 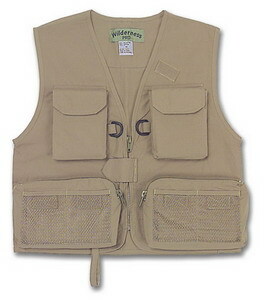 For less than $150, you can find fly fishing vests made of comfortable, lightweight nylon with a mesh interior and a rib-knit collar to keep you comfortable. Storage space is divided among 16 pockets and two back pockets with zippers. A less traditiona version offers cloth straps over the shoulders from which hangs two large zippered pockets with four interior pockets, and an open section large enough for fly boxes. On the outside of the back of these large pockets, you'll find two tippet pockets and a security pocket, equipped with snaps. For over $150, you'll find the best of the best. You can find a form-fitting vest or chest pack that comes with a replaceable CO2 cartridge. With a single pull of a lanyard, the cartridge instantly inflates the vest in case of emergency. The collar is fleece-lined for comfort. The fleece wicks away moisture and sweat. Plenty of pockets are handy for all your gear. 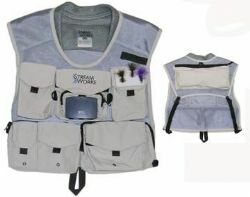 Or, you can choose a water-repellent cloth vest that features large lower zippered front pouches that each contain four separate interior pockets. Snap closing pockets on the front are the perfect size for reels. Upper pockets are suitable for a camera and film, flashlights, or anything else you need to bring along. One pocket is lined with moleskin to prevent scratching of sunglass lenses.